1- Heat the oven to 220 C / 425 F / gas 7. 2- Scrub the potatoes with a stiff brush until absolutely clean, Pat dry and prick all over with a fork. Bake in the oven for 1-1 1/4 hours, or until cooked through. 3- In a bowl blend the soured cream, finely chopped chives, ground cumin and beaten egg. 4- Remove the potatoes from the oven and reduce the temperature to 190 C/ 375 F/ gas 5. 5- Cut the potatoes in half and scoop out the centers with a sharp spoon, taking care not to break the skins and leaving a shell about 5 mm / 1/4 in thick. Sieve or mash the potato in a large bowl. Beat in the butter and the soured cream mixture.Season with salt and freshly ground black pepper to taste. 6- Arrange 4 of the best potato shells on a metal tray. Spoon the potato mixture into these shells, mounding them slightly, and sprinkle with paprika. 7- Cut the bacon slices in half and roll each one up. Place 1 roll on each potato-filled shell and bake in the oven for 20-25 minutes, or until golden brown. 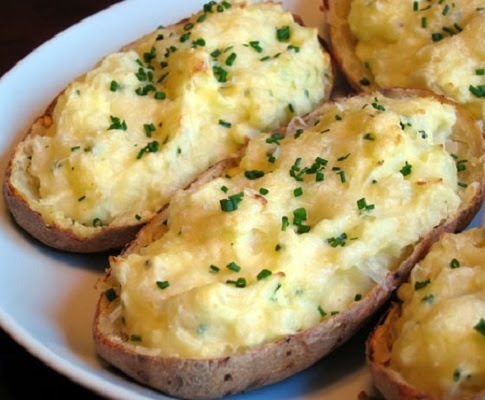 Baked potato with soured cream is ready to eat in dinner.